The culmination of two years of work, ‘Declaration’ is eL Seed’s most ambitious sculptural work to date. A renowned calligrapher and street artist, eL Seed ventured into the world of sculpture during a year-long residency at Tashkeel art centre in 2013. Soon afterwards, he was approached by Emaar to develop an impactful and iconic public art commission for the then unbuilt Dubai Opera. eL Seed describes the work as “a declaration of love to the city that I call home,” and to Arab calligraphy. From beginning to end the work took two years to complete and required the help of 31 craftsmen. 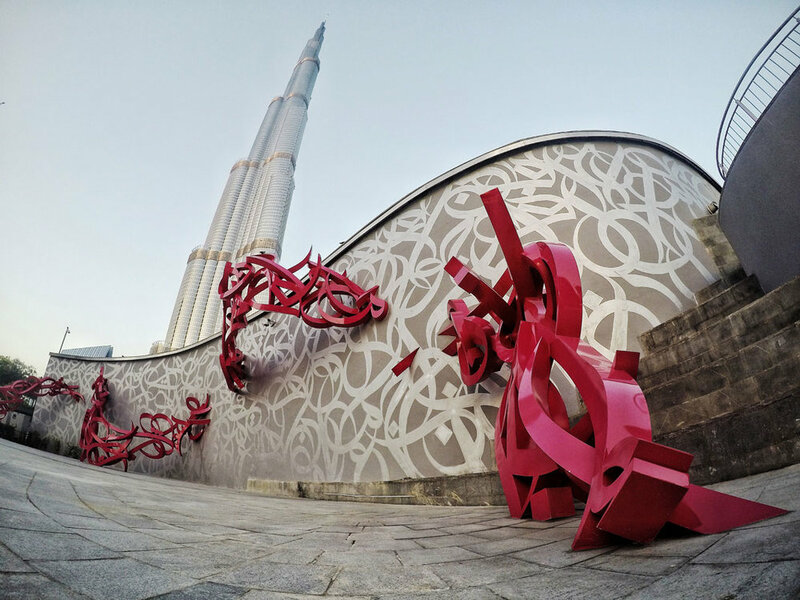 ‘Declaration’ consists of intricately shaped steel forms, undulating in and out of the wall, spelling out the Arabic phrase over a span of 30 meters. The form is painted in an eye-catching electric pink. ‘Declaration’ is the eL Seed's first work of this scale to be placed in a public space. As such, it was significant for the artist that this take place in the UAE, an Arab country; supporting the burgeoning scene of the city where the artist makes his home.